Automatic way is a simple "Default EurekaLog state in new threads" option. This option is set to "Disabled (recommended)" value by default. 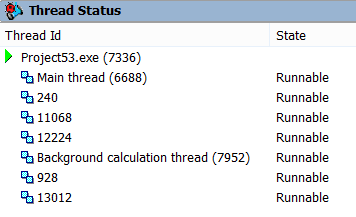 You can change this option to "Enabled" or "Enabled for RTL threads, disabled for Windows threads" states: EurekaLog will be enabled automatically when creating corresponding threads. Important note: it is highly not recommended to use automatic enabling. Enable EurekaLog manually for each of your threads. • There are even threads created by Delphi/C++ Builder IDE to perform debugger tasks! Obviously, almost all of these threads were launched with some exception handling code in mind. Creator (3rd party code) expects these threads to behave in some specific way when exception is raised in a thread. Injecting EurekaLog processing and handling into every thread would be risky and unnecessary. Normally, you should only enable EurekaLog for threads which you know. That is threads created by you, or threads which runs your code (such as threads from thread pool). You should not enable EurekaLog for arbitrary/unknown threads. For this reason it is highly recommended to use manually controllable activation. You can use BeginThreadEx function instead of BeginThread function and use TThreadEx class instead of TThread class to create EurekaLog-enabled threads. If you can not control thread creation code (think of thread pools as example) - then you can use SetEurekaLogStateInThread function. • Firstly, this option remains the most simple way to enable EurekaLog for threads. You don't need to review/change your code (e.g. you don't need to search&replace "BeginThread -> BeginThreadEx" and "TThread -> TThreadEx"). • Second, there may be cases when you have no control over thread's code at all, but you still want to get bug reports for exceptions in such thread (i.e. thread's exception handling code just invokes default exception handler, which is hooked by EurekaLog). Important Note: You can change "Default EurekaLog state in new threads" option for the above usage cases, but we recommend to use "Enabled for RTL threads, disabled for Windows threads" position when possible. Never turn "Default EurekaLog state in new threads" option into "Enabled" position until really needed.